Nairobi is the operational headquarters of IGI. IGI Kenya also exists as an affiliate with a large membership among young Christian professionals and across several of the big estates in Nairobi. IGI Kenya has pioneered the Community Taxpayers’ Assemblies and has been very active in civic education (e.g. before and after the 2010 referendum on the new constitution). 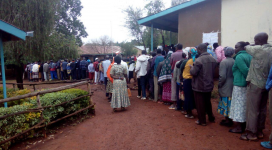 In view of the apparent failings of process leading to the annulment of the elections, and continuing concerns about irregularities, IGI Kenya wrote to IEBC (electoral commission) and had a meeting with them 13 October, to discuss concerns. IEBC gave assurances that further changes will be made, which are to be published 15 October. Since the election legislative changes have also been proposed, on which the government has invited consultation, and to which IGI Kenya has replied comprehensively. Unfortunately, the changes seems more aimed to avoid a successful legal challenge in future, than to correct any underlying irregularities, and have given widespread concern. There are now 24 registered Community Taxpayers’ Assemblies.